Welcome to Craf-TAY Corner, the monthly feature that showcases the creative side of the people of Talk Amongst Yourselves. If you paint, draw, craft, cosplay or do any other creative type hobbies, this is the thread to talk about your current and upcoming projects and show off your completed projects to the peeps of TAY. 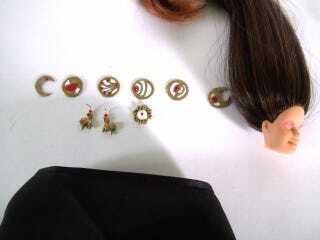 Progress is really moving on my Bayonetta doll, even if it doesn't quite look it yet. The weather is finally decent so I was able to finish rooting the doll (putting in the hair) as well as spray the first couple coats of sealer and blush her (add the soft colors to a doll either via airbrushing or powdered pastels. I use pastels.) I was going to paint her last weekend, but I ran out of time after a few appointments came out of the blue. I finished all the charms for her costume, though I ran into a snag with her glasses. I didn't make them big enough so the ones I had made out of resin snapped. I think for the second version I'll use black card stock since that has a bit more flexibility. I've also gathered all the material for her outfit. I bought the chain a few months back, now I have the fabrics. The next step is finish painting her face, and then making the pattern for her costume. Patternmaking is always a challenge and a bit time consuming, and with now just a little over a month until Denver Comic Con, I'm not sure how much more progress I'll make. On the other hand, that over-achiever Stormborn has almost finally achieved his goal of redrawing and redesigning all the Pokemon of the 1st Gen. Knowing how time consuming (and brain consuming) concept art is, it took a great deal of dedication to devote almost half a year to draw Pokey-manz. He managed to have an amazing variety of styles and concepts and really stretched his artistic muscles to come up with some interesting designs. Congrats man! Also, I hate you. Since it's May it's really revving up to be Con season. I know there've already been some really big Cons already, so if you went somewhere in costume, I'd love to see how your stuff turned out. In fact, if you have any projects that you want to talk about, please share! I know I and the TAY community love to see everything everyone does creatively. If you want to be featured in next month's Craf-TAY corner, start a thread on your blog and tag it 'Craf-TAY Corner'. If you don't tag it properly I have a hard time finding it. Also, if you have any questions or suggestions about the feature, you can contact me on my TAY Contact Page.